The character selection screen in Super Smash Bros. Ultimate with all of the characters unlocked and all DLC characters purchased. The character selection screen, also called the character selection menu and abbreviated as CSS, is the menu where a player chooses their character to be used in a game mode and also where the player may sometimes make changes to the rules. The character selection screen is composed of boxed portraits of the heads or busts of playable fighters, normally arranged together by game series or related characters, with more characters added once they are unlocked or downloaded. It is utilized in each game and appears in both single-player and multiplayer modes where the player is not required to use specific character(s). Character selection screens are almost always uniform across game modes for each game, with the exception of the character selection screen for Tournament Mode and the Subspace Emissary single-player mode in Brawl which uses a very featureless character selection screen for assembling a party of characters. Mario's portrait in Melee's Character selection screen. Each player controls a small hand cursor which carries an emblem displaying their control port number and color. Selecting a character involves carrying the emblem over the character portrait and pressing a selection button. A box at the bottom of the screen will usually change to reflect the character choice; in Super Smash Bros., a full model of the character will appear and strike a pose while in Melee, Brawl, SSB4, and Ultimate, only a larger area of the character's portrait is shown. Player character portraits after character selection are usually interactive. In Super Smash Bros. the color of the character's model will change in real time when cycling through palette swaps. The player can cycle through the palettes of each character in Brawl in an alternate way by pressing the selection button while hovering their hand cursor over the player character's portrait. Additionally in Brawl and Ultimate, the player can select the default form or starter character where applicable by using the cursor to highlight the form or character in the portrait. The only character that has a transformation that cannot be chosen by means of a character portrait is Samus. 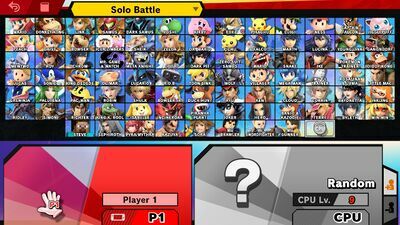 In Ultimate, players can change the character selection screen so that Echo Fighters can be stacked together in the same slot with the fighters they are based on. When such option is enabled, the player may switch between the base fighter and his or her Echo Fighter by selecting the desired character icon on the top right corner of the character's portrait. Stacking echo fighters also causes Mii Fighters to also be stacked, similarly to how they were in SSB4. This option will only affect the screen in Vs. Mode, Tourney, Custom Smash, Super Sudden Death, and Quickplay. A player may also choose a name from an expandable box in Melee, Brawl, SSB4 and Ultimate. Single-player modes typically feature character selection screens with only one area for a player character portrait and a separate area where options for mode difficulty and/or a stock count until a continue is needed. There is typically an area that highlights highscores for that mode. Multiplayer mode character select screens typically feature a way to change quickly between free for all or Team Battles and coin, stock, or time battles, as well as a way to quickly change simple parameters like stock amount and the time limit. Attempting to change the battle mode in Melee and Brawl accesses more advanced options by opening an option menu. Depending on the options and game mode set, additional parameters may be found in the character portrait, such as the sliding weight scale in Melee. Ways to activate computer players and adjust their difficulty are also found in the character portrait. A Random icon appears for selection in Brawl, SSB4, and Ultimate, which randomly chooses a playable character. In Melee, a random character can be selected by placing the cursor on one of the empty bottom corners once all characters have been unlocked. In Melee's Tournament Mode, the Pokémon Ditto, while not selectable by usual means, replaces this function. In Ultimate, it is possible to increase or decrease the number of character slots opened (from a minimum of 2 to a maximum of 8) by selecting "+" and "-" buttons on the right side of the screen, although it is still possible to leave slots empty like in previous games. Once character selection and mode option requirements have been met, the game will give some kind of indication, such as a "Ready to fight!" banner and a confirmation sound. The player can proceed by selecting the banner or pressing the start button. The character selection screen in Super Smash Bros. with all characters unlocked. The character selection screen in Super Smash Bros. Melee with all characters unlocked. The character selection screen in Super Smash Bros. Brawl with all characters unlocked. The character selection screen in Super Smash Bros. for Nintendo 3DS with all non-DLC characters unlocked. The character selection screen's first page in Super Smash Bros. for Nintendo 3DS with all characters unlocked. DLC characters are placed on a second page, as noted by the arrow. The character selection screen's second page in Super Smash Bros. for Nintendo 3DS, exclusively containing DLC characters purchased. The bottom screen in Super Smash Bros. for Nintendo 3DS. The character selection screen in Super Smash Bros. for Wii U with all non-DLC characters unlocked. The character selection screen in Super Smash Bros. for Wii U with all of the characters unlocked and all DLC characters purchased. The character selection screen in Super Smash Bros. Ultimate with all non-DLC characters unlocked. The character selection screen in Super Smash Bros. Ultimate with all non-DLC characters unlocked and Echo Fighters stacked. The character selection screen for Squad Strike in Super Smash Bros. Ultimate with all non-DLC characters unlocked. The character selection screen for Squad Strike in Super Smash Bros. Ultimate with all of the characters unlocked and all DLC characters purchased. The character selection screen used in Super Smash Bros. without any characters unlocked. The character selection screen used in Melee without any characters unlocked. The character selection screen used in Brawl without any characters unlocked. The character selection screen used in Super Smash Bros. for Nintendo 3DS without any characters unlocked. The character selection screen used in Super Smash Bros. for Wii U without any characters unlocked. The character selection screen used in Ultimate without any characters unlocked. The character selection screen for Squad Strike in Ultimate without any characters unlocked. A beta character selection screen in Super Smash Bros..
A beta character selection screen in Melee. Another beta character selection screen in Melee. Zelda's portrait has been omitted. The character selection screen used in the E for all demo of Brawl. The character selection screen from the E3 demo of Super Smash Bros. for Nintendo 3DS. The character selection screen used in the public demo of Super Smash Bros. for Nintendo 3DS. The character selection screen from the E3 demo of Super Smash Bros. for Wii U. The character selection screen from the E3 demo of Ultimate. The "Ready to fight!" banner in Super Smash Bros.. The "Ready to fight!" banner in Melee. The "Ready to fight!" banner in Brawl. The "Ready to fight!" banner in Ultimate. Super Smash Bros. is the only game to feature all portrait boxes for characters that have not been unlocked. Super Smash Bros. is the only game to have characters perform a brief animation in their player's display box when they are selected. In multiplayer modes in Melee, Brawl, and SSB4, KO Stars appear in the player character portrait tallying the number of stocks taken off of other players. In Brawl, a unique sound effect will play if the player is using a Wii Remote while selecting a character. When a character is selected in Super Smash Bros. for Wii U, a small sparkle effect will appear over their eyes (or in Mr. Game & Watch's case, where the eyes would be). In Super Smash Bros. for Nintendo 3DS, the character selection screen will add another page for DLC fighters as Extra Fighters when all characters have been unlocked and more than four have been purchased. Prior to version 1.0.4, lifting the character selection token for a CPU Mii Fighter in With Friends in Super Smash Bros. for 3DS would often cause the game to crash if the player is not the original room creator. Strangely, Mario, Pikachu and Villager's portrait used their in-game model as opposed to their official render in the E3 demo of Super Smash Bros. Ultimate. This has since been fixed. In Melee, Sheik is the only (starter) playable character that cannot be seen in the character selection screen. On the beta version, however, Zelda is the only playable character that does not appear on the character selection screen, possibly to hide her identity, which is why Sheik is shown first. Similarly, Zero Suit Samus is the only character to not appear in Brawl's. Zelda and Sheik are the only two characters to share the same character slot, although only in Brawl, despite Sheik first appearing in Melee (see above). This page was last edited on March 22, 2019, at 20:30.